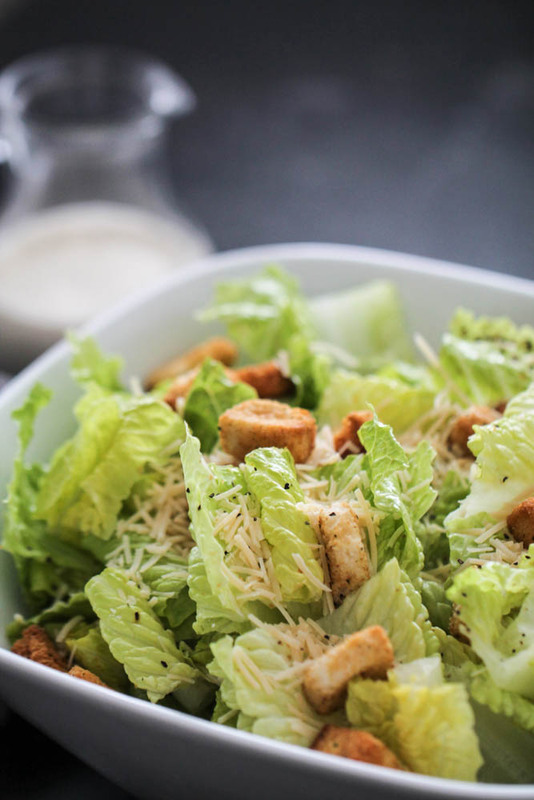 This Easy Homemade Caesar Salad and Dressing has crisp romaine topped with garlic croutons and parmesan cheese and is tossed in an easy homemade caesar dressing. This simple homemade caesar salad dressing is made without anchovies and has no raw eggs, so it's kid-friendly and picky-eater approved! 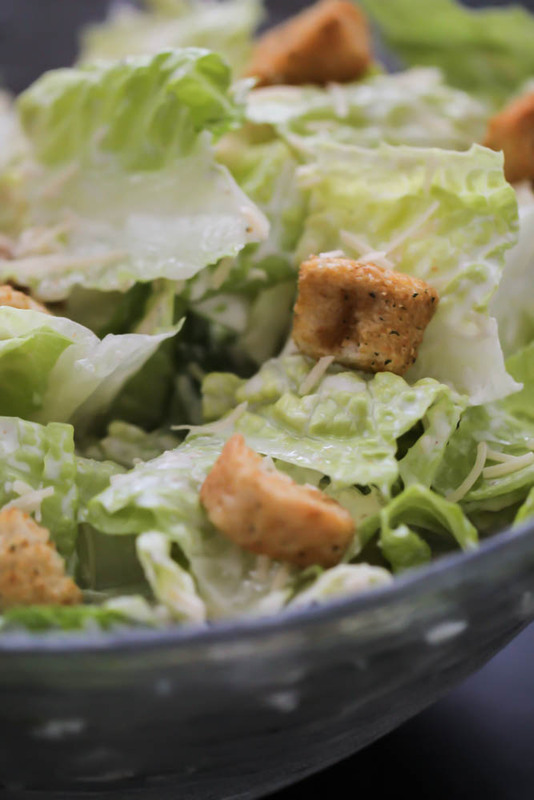 Our family loves serving Caesar salad with dinner anytime we are having pizza or pasta. Rather than opening up a pre-made package of Caesar salad, I thought I would whip up a homemade version. 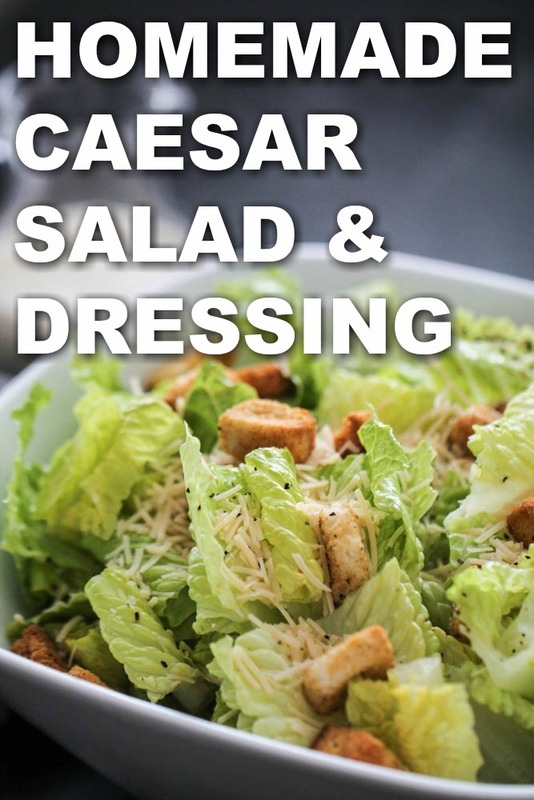 This Easy Caesar Salad and Homemade Caesar Dressing is so delicious and full of flavor that you’ll want to make it all the time! 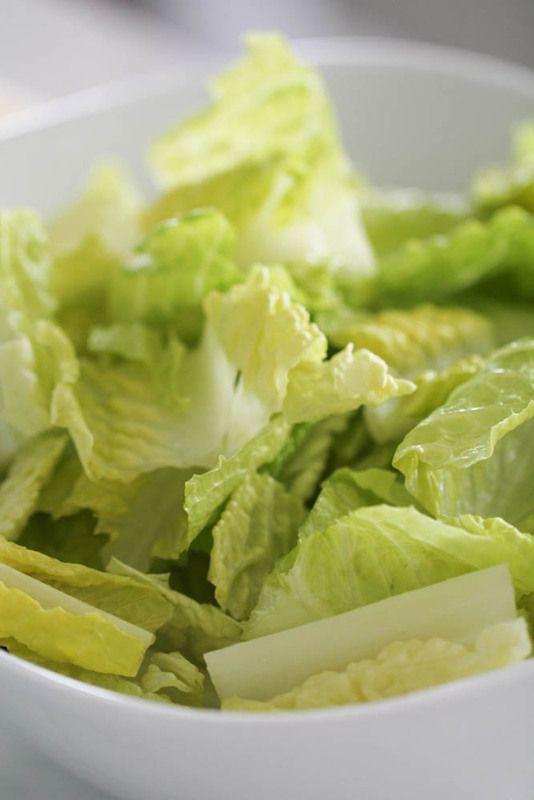 Where does Caesar Salad come from? Caesar salad comes from the salad’s creator, a chef named Caesar Cardini. Cardini was an Italian immigrant who operated restaurants in Mexico and the United States. He was working in Tijuana at the time his daughter, Rosa, recounted that her father invented the salad at his restaurant. Cardini had limited ingredients after a 4th of July rush at the restaurant, so he made the salad table-side by tossing together romaine, eggs and the ingredients he had on hand. The rest is history! 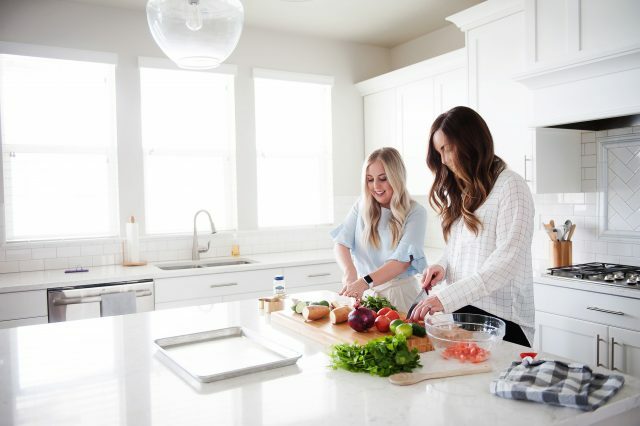 What ingredients are in Caesar Salad? 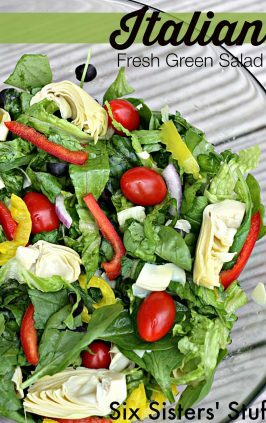 This Easy Caesar Salad Dressing is made without anchovies or raw eggs, so you don’t have to worry about any food contamination. To make this easy Caesar dressing, simply whisk together grated parmesan cheese, mayonnaise, milk, lemon juice, dijon mustard and minced garlic. If you prefer a smooth dressing, simply add all dressing ingredients to a blender and blend until smooth. That’s it! So easy, right? You’ll never want to go back to bottled Caesar salad dressing again. Start by washing and drying the leaves of three hearts of romaine, then chop roughly and place in a large serving bowl. Top with parmesan cheese, croutons and season with salt and pepper. Toss until combined. Pour prepared dressing over the top and serve. 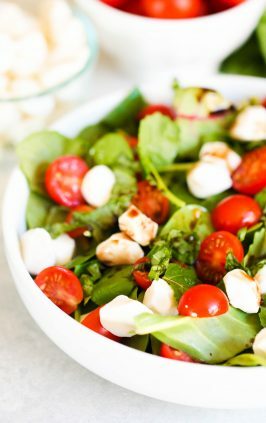 If you aren’t serving the salad immediately after making it, store dressing in the fridge and dress right before serving. 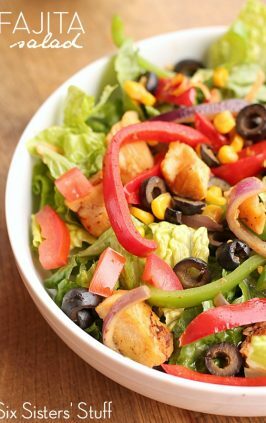 If you dress your salad too early before eating it, it can get soggy. 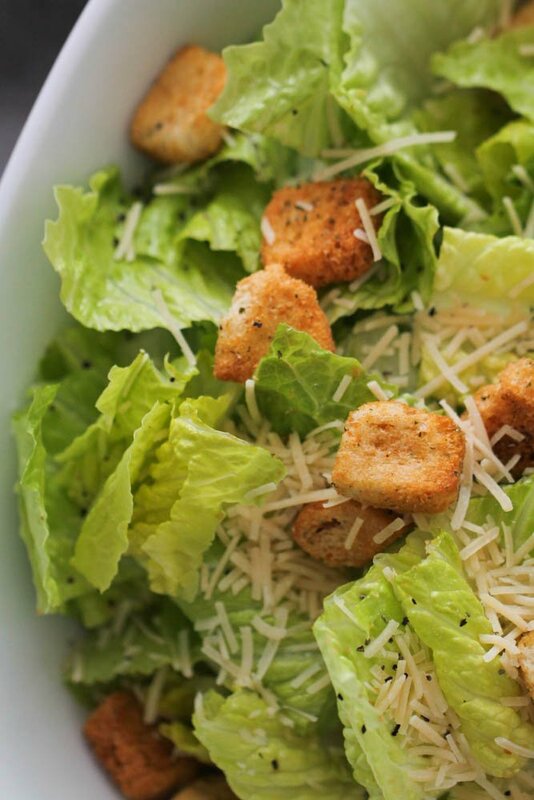 Crisp romaine topped with parmesan cheese and croutons and tossed in an easy, homemade caesar dressing. 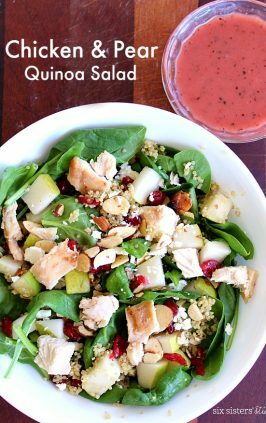 In a large serving bowl, combine chopped romaine, 1/4 cup grated parmesan cheese and croutons. In a small mixing bowl, whisk together 1/4 cup grated parmesan cheese, mayonnaise, milk, lemon juice, dijon mustard and minced garlic. Pour dressing over salad, toss to coat and serve. 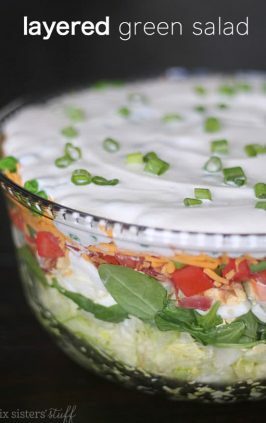 If you aren't serving immediately after preparing, store dressing in the refrigerator and dress salad prior to serving. Looking for other delicious side dishes? 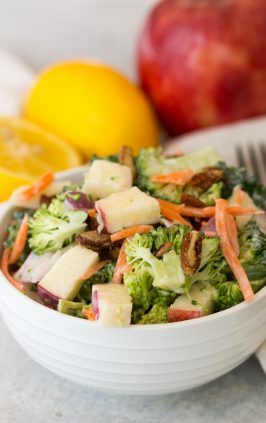 Watch below to see how to make our Loaded Broccoli Salad that’s perfect for potlucks and parties!